Concord, April 22, 2010: Today Jack Roush, owner of Roush Fenway Racing and Roush Industries, activated the largest photovoltaic (PV) installation in the state of North Carolina by a private individual. 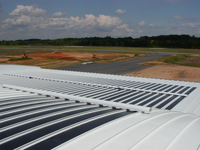 The PV install is atop his hanger located in Concord, N.C. The 20 kW system will be the sixth largest in the state and generate over 28,000 kWh of electricity annually that will be put directly into the utility grid for consumers to use. This new, clean alternative energy source will save over 41,000 pounds of carbon dioxide gasses entering our atmosphere each year. Over the installations useful life, the system will generate enough electricity to power 16 households for a year. Ian Prince, Roush Fenway’s manager, real estate and sustainability worked with Uni-Solar on the PV installation project. PV’s are arrays of cells containing a solar photovoltaic material that converts solar radiation into direct current electricity. According to Robert Kropp of SocialFunds.com, PV production has doubled every two years, increasing by an average of 48 percent each year since 2002, making it the world’s fastest-growing energy technology. Always a leader in the sport of NASCAR on and off track, Roush’s continued commitment to promote more sustainable operations and better environmental management is an ongoing process. During this week’s 40th anniversary of Earth Day, Roush and his group of companies hope that others will follow in their footsteps.